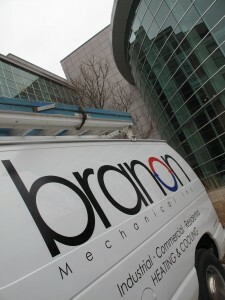 Branon Mechanical is an Oakville based Mechanical contractor, providing a wide range of services and expertise on all types of commercial and industrial HVAC systems. At Branon Mechanical we believe that trust is critical, difficult to gain and easy to lose. This philosophy, along with our commitment to a lean, but yet responsive service organization has allowed Branon Mechanical to continually deliver cost effective projects in this rapidly changing world. Our technicians are licensed; manufacture equipment trained and highly skilled in the HVAC industry. We are equipped to handle simple repairs to complex construction projects, while always meeting and addressing our clients’ installation, maintenance and service needs. We know that our customer’s success depends on having a great partnership with Branon Mechanical. Our proper solutions will keep our customer’s equipment operating at peak performance while minimizing costly downtime.